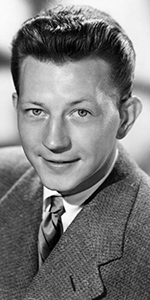 Donald O'Connor as host of the television program The Colgate Comedy Hour on NBC in 1952. Donald O'Connor was a very appealing song-and-dance man, who will be forever remembered for his appearance in the classic musical Singin' in the Rain (released in April, 1952). Both of Donald's parents had been in vaudeville, so he considered it appropriate to include his mother in his Forecourt ceremony. Born in Chicago to Irish vaudeville entertainers John and Effie O'Connor, at three years of age, Donald and his older sister Arlene were in a car crash which took Arlene's life. A few weeks later, his father John suffered a fatal heart attack while performing in Brockton, Massachusetts. Alone with her baby Donald, Effie taught the lad everything she knew about show business. Many people have commented on O'Connor natural gifts — it's not an act — it's real. The O'Connor's trundled themselves off to Hollywood, where Donald made his film debut in the comedy It Can't Last Forever (released in July, 1937). He was given an acting contract at Paramount, where he played Fred MacMurray as a young boy in Men with Wings (released in July, 1938), and Bing Crosby's younger brother in Sing You Sinners (released in September, 1938). After playing Gary Cooper's character as a young boy in Beau Geste (released in July, 1939), Donald returned to the vaudeville stage for a year. Now 16, O'Connor signed up with Universal, where he appeared in several of the studio's "B" musicals, like What's Cookin' (released in February, 1942), Private Buckaroo (released in June, 1942), and Give Out, Sisters (released in September, 1942). In these pictures, O'Connor formed a trio with actressess Gloria Jean and Peggy Ryan. The group was doing so well, that Universal decided to up the budget on the latest O'Connor / Jean / Ryan musical Mister Big (released in May, 1943). Partnering with Peggy Ryan, O'Connor starred in Top Man (released in September, 1943), Chip Off the Old Block (released in February, 1944), and appeared together in the Universal revue musical Follow the Boys (released in May, 1944). When O'Connor turned 18, he was drafted into the Army. Universal rushed to complete four more O'Connor / Ryan musicals, which kept O'Connor before the public while he served in the U.S. Special Forces, giving performances throughout the Pacific theatre. Upon returning, Universal-International temed him up with Deanna Durbin in Something in the Wind (released in July, 1947). He cranked out several more musicals in the late 1940s. Things changed with his appearing in Francis (released in February, 1950), where he played straight man to a talking mule. A whopping hit, O'Connor was contractually tied to make a new Francis film per year, his next being Francis Goes to the Races (released in May, 1951). Directors Gene Kelly and Stanley Donen chose O'Connor to round out their headliners in their classic musical Singin' in the Rain (released in April, 1952). His Cosmo Brown character's performance of the "Make 'Em Laugh" number is astonishing in a film full of great musical numbers. On the strength of this film, Donald O'Connor became a freelancer, after making Francis Goes to West Point (released in July, 1952), and I Love Melvin (released in March, 1953) with Debbie Reynolds. During this timeframe, O'Connor was an occasional host on The Colgate Comedy Hour, which brought him an Emmy. O'Connor's all-time favorite dancing of his was in the film Call Me Madam (which played the Chinese in April, 1953) with Ethel Merman. After Francis Covers the Big Town (released in June, 1953), O'Connor appeared in Walking My Baby Back Home (released in December, 1953) with Janet Leigh, and Francis Joins the WACS (released in July, 1954). He made the all-star cast of There's No Business Like Show Business (which played the Chinese in December, 1954). He got his own sitcom on NBC called The Donald O'Connor Show in the 1954-55 season. His last Francis film was Francis in the Navy (released in August, 1955). He co-starred with Bing Crosby in Anything Goes (released in April, 1956), and took the title role in The Buster Keaton Story (released in May, 1957). After starring with Glenn Ford in Cry for Happy (released in January, 1961), and The Wonders of Aladdin (released in December, 1961), O'Connor took some time away from Hollywood, returning to make That Funny Feeling (released in August, 1965). In 1968, he hosted his own talk show, The Donald O'Connor Show in syndication, but the show was not a success. A heart attack and other health problems followed in 1971. Dancing in the "Dancin' on the Silver Screen" number on the Oscars in 1980, led to his appearing in the film Ragtime (released in December, 1981). He went to Broadway to star in Bring Back Birdie during the 1981 season, and played Cap'n Andy in a Broadway revival of Show Boat in the 1983 season. He appeared in Toys (released in December, 1992) with Robin Williams. His last film was Out to Sea (released in July, 1997), with Walter Matthau and Jack Lemmon. He died of heart failure in 2003. Grauman's Chinese Theatre, Hollywood, California. Donald O'Connor Forecort ceremony, Wednesday, February 25, 1953. 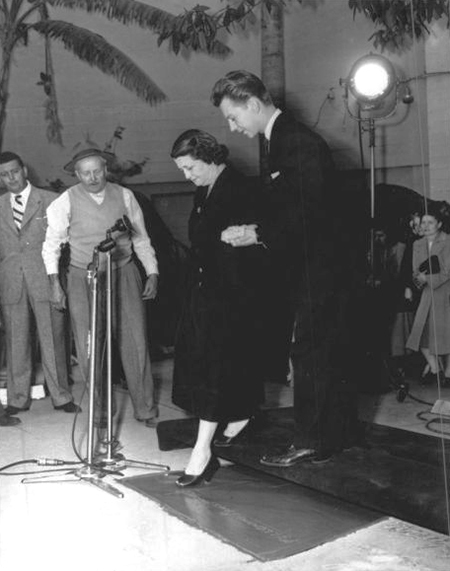 Grauman's Chinese Theatre manager Ralph Hathaway and cement artist Jean Klossner look on as Effie O'Connor is helped into her footprint by her son, Donald O'Connor.